You read the headline correctly, the Texas Aggies are considered the No. 1 overall team — in a very early preseason poll — for the 2013 season. While I personally couldn’t be more excited and flattered by the ranking, I take it with a grain of salt. Why? Because there are a lot of reasons for ranking the Aggies number one, however, none of these reasons really matter as it is currently January 16, 2013. On the other hand, the person that gave A&M the top spot in this early poll is none other than Dennis Dodd (senior college football columnist for CBSSports.com). In other words, the number one spot was not given by some “hack” with a blog by the name of OnePointSafety.com. It was given by one of the most well-respected national college football writers. In his article, Dodd listed several reasons why he decided to list A&M as number one. Of course, what really matters is whether or not he will vote them number one again when polling starts for the major preseason polls. Of course, assuming there are no major surprises between now and August, I don’t see why he wouldn’t. However, below I have posted a list of reasons why someone might vote A&M as their preseason number one as well as a few reasons why they might not. If it is January 2013 and there is very little college football to write about, write an article stating your argument for why one of next season’s (most likely) top five teams should be given the number one spot. This is always a good way to increase your online traffic during the off-season. A&M is the only team that beat this season’s BCS National Champion — Alabama. 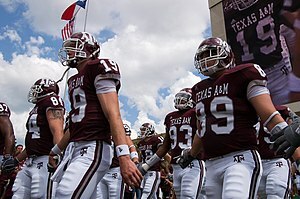 A&M’s 2013 squad should be as good or better than the 2012 squad, and they face Alabama at home. One of A&M’s two losses in 2012 was LSU and the Tigers will be losing a significant amount of talent to the NFL draft. Johnny Manziel, Mike Evans, Jake Matthews, etc. A&M ‘smoked‘ what was considered a very talented Oklahoma team in the Cotton Bowl. A&M lost two games in 2012. A&M will be losing some talent this spring to the NFL draft and graduation (i.e. Luke Joeckel, Damontre Moore, and Ryan Swope). Alabama has won the last two consecutive BCS National Championships (as well as the 2009 title) and looks poised to do it again in 2013. We haven’t yet seen the recruiting classes or spring football (for A&M or Alabama). Every program goes through changes during the offseason and it is always easier to judge a team in August (than in January). Oregon, Kansas State, Alabama, Notre Dame, Ohio State, Georgia, Florida, LSU, Louisville, and a few others could be considered number one for 2013. There is nothing wrong with Dodd making an early argument that Texas A&M deserves the number one spot. However, all of the factors that he listed in his article (plus the ones I listed above) will have to remain a “positive” in order for the Aggies to grab the number one spot in either the AP or Coaches’ Poll this summer. This entry was posted in 2013, Ballot, BCS, Poll, Preseason by Travis Normand. Bookmark the permalink. Oregon and Stanford is going to be a pretty interesting battle for years to come. I honestly believe that Oregon is probably the better squad this year, but I’m just a hack blogger. All we have is our random opinions. Don’t read to far into the pre-season #1. If I recall from just one year ago, USC was in that same spot. True. It didn’t work out for USC either. But the recognition is nice.